You will have access to the Game Room's, pool table, shuffle board, big screen TV, small fringe, and our juke box. You will also have access to the Great Room of the Main House/Lodge. With Fire Place, Game Table and a 80" Big Screen TV. After a long day of fishing, boating, site seeing, or golfing you can relax or nap on one of our seven leather recliners. 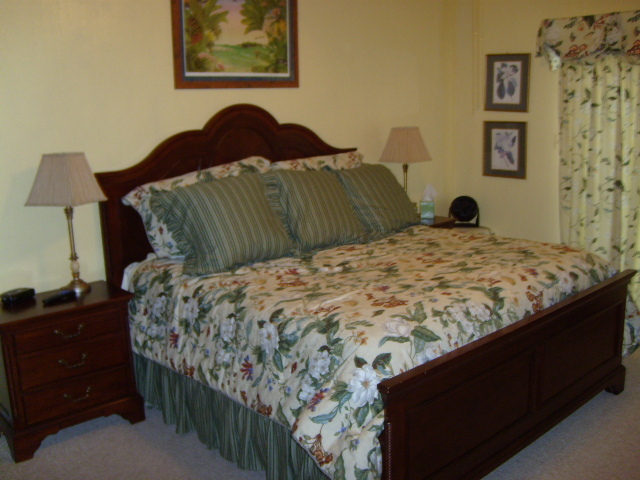 Our Bed and Breakfast is one of the options you have when staying with us at Green Acres. We offer a clean and comfortable sleeping room with a King Size Bed, a private bathroom, and a personal TV for your enjoyment. You will also have access to the main house, the game room, the boat house, our boat launch, the floating sundeck, and the outside covered patio area. This is a great option for couples or singles who want to enjoy all that Toledo Bend has to offer, especially the fishing and boating, but who don't want to rough it. With the B&B option we offer a hot, fresh, and delicious breakfast to start off your day here on the Toledo Bend Reservoir. Green Acres B&B is a unique property offering our guests some flexibility in when you actually have your breakfast. In order to take full advantage of the fishing, boating, or hunting in this area, many of our guests start their days very early. Therefore, we offer a late breakfast for those guests who want to start their day early and would like to come in for a late breakfast or lunch. Please make arrangements in advance. Again, there is no smoking allowed in the main house or lodge and sorry, no pets.